A C-section recovery may be slower than a vaginal birth as you are recovering from surgery as well as recovering from having a baby. 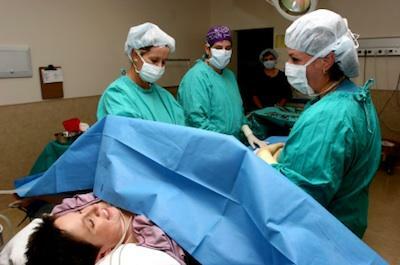 A Cesarean birth is considered major surgery. C-section recovery is different for every woman, but most women have no complications and recover fairly quickly. Expect to recover in the hospital for three to four days. Below is what you can expect in your recovery both in the hospital and when you go home. After your c-section, you will be taken to a recovery room. Nurses monitor your incision, vaginal bleeding, firmness of the uterus, blood pressure, temperature, and pulse. The anesthia from the surgery will start to wear off while you are in the recovery room. You will probably have an IV in place at this time from the surgery. The nurses can use the IV to administer pain medicine or they may remove the IV while you are in the recovery room. Since you will probably want to hold your baby, the nurses will assist you in picking him until you are comfortable getting out of bed on your own. If everything is proceeding as normal, you will be moved to your private or semi-private hospital room. You and your baby will be together in your hospital room. You will be expected to stand up and get your baby from a bassinet as soon as you are able. It may seem all too soon, but the nurses will help you get up and walk around so that you can care for the baby and go use the restroom on your own. Moving may be painful, but walking helps speed up recovery, eases constipation, and may prevent blood clots. The nurses will assist you in your first trip to the bathroom; in fact they will monitor how often you urinate and how many bowel movements you have while in the hospital to make sure you are recovering normally. You may feel sore in the abdominal region for a few more days; continue taking your pain medication as prescribed or as needed. Your obstetrician and the baby's pediatrician may also visit you once per day to monitor your progress and release you to go home. C-section recovery may be slower than a vaginal delivery, so expect to take it easy your first couple of weeks at home. Most doctors recommend that you do not drive a vehicle for one week after your c-section. Vaginal bleeding is the same as you would have as if you had delivered vaginally, so have plenty of pads on hand. Your incision should heal fine, however, be careful not to strain your stitches. The incision may itch after a couple days; this is a good sign that it is healing normally. Do not pick up heavy loads for a few weeks. Ask for help carrying the baby in its carrier, especially going up and down stairs. It is a good idea to have someone help you lift the baby in and out of the car for the first couple weeks as well. Some women experience numbness around the incision for several months or more. This is normal as many of the nerves in the abdominal wall were incised as well. The nerves should heal and grow back so that all feeling will be back to normal. Today's c-sections are much better than they were even 10 years ago. They are safer, the scarring is less visible, they are less painful, and the recovery time is quicker. If you are going on maternity leave after the baby is born, most states have maternity leave laws that are longer in duration for a c-section than a vaginal birth, so you may get more time off with your baby.